Description Fiber Optic Ethernet Media Converter kit*.Requires a small form-factor pluggable (SFP) module (sold separately). * Kit available separately and must be installed inside the AUTODOME power supply box. IP dome camera with clear bubble and indoor/outdoor pendant housing. 30x zoom, 1080p HD. Essential Video Analytics, Intelligent Dynamic Noise Reduction, remote camera access, and dual power options. IP dome camera with clear bubble and indoor in-ceiling housing. 30x zoom, 1080p HD. 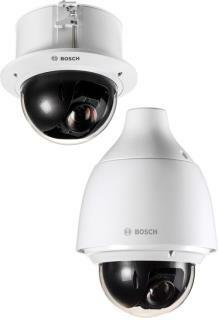 Essential Video Analytics, Intelligent Dynamic Noise Reduction, remote camera access, and dual power options.